Traverse City's North Peak Brewing makes simple, yet solid beers. They aren't all about frou-frou-ing them with unusual ingredients or a piling on a ridiculous bevy of spices. A very liberal use of hops though? Yeah! They are all over that tip though. When I spotted this, labeled as a Hoppy Pumpkin Ale, of course I was curious. My gal-pal, a foodie and wine fan with still a bit of a neophyte when it comes to all the great brews out there and after having feelings of pleasant to total disappointment on some of the pumpkin beers she's tried on her own in the past, asked me to keep and eye out for ones she hadn't tried so we could give 'em a shot. Hmmm. Beer and drinking it with girls? You don't have to twist my arm. The brew pours a transparent and bright pumpkin copper orange. The head was very minimal save for some spotty clouds and a few bubbles around the rim. Very little lacing because of this. On the nose there's good chunk pumpkin meat, a large bit of white pepper and fresh mowed grass from the hops and a little flourishes of graham crackers. 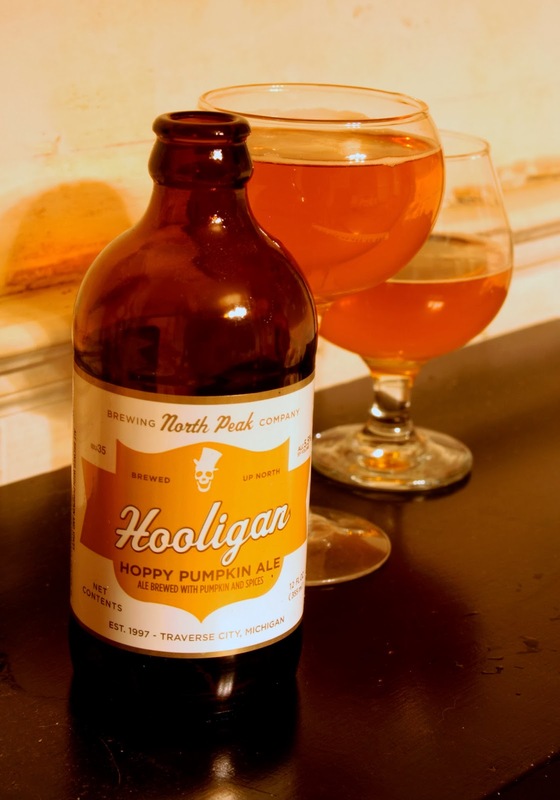 Different from a from a huge number of other pumpkin beers that smell like all the spices that go into a pumpkin pie but stray away from the actual pumpkin itself not to mention still being a beer. The hops jump right out front in flavor. At first it seems more about being an IPA (North Peak's Diabolical in particular) with a distinctive citrus and earthy bitters along with a counter balance of sweet malts. Fresh pumpkin flavors then start to emerge adding an interesting twist in the middle. As the brew breaths and warms slightly the pumpkin comes more to the forefront, mellowing out the very big (and good) hop forward slant along with some slight nuances of nutmeg and cinnamon. The finish is slightly dry and piney like one would expect from any beer that says "Hoppy" right on it's label. One of the most interesting things about this beer is that, as I mentioned before, the spice is something to add some character to the taste but not the main thing about the flavor. This one depends more on the hops to give it an oomph and bite. to give a short one line description of this would be a pumpkin juice infused Michigan styled IPA. Quite interesting and much different from the many sweet spiced ones that are can be found all around this time of the year.